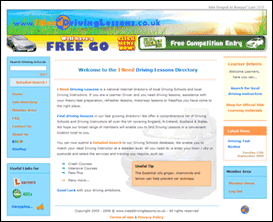 The 'I need driving lessons' directory is a complex data driven site. Providing registration, billing and statistic tracking of driving school members. Unique search facilities enable prospective pupils to find close matching driving schools and instructors. The website also boasts member, latest news and shop areas, and randomly selected best practice driving and useful tips. Much work has also gone into a comprehensive admin system behind the scenes which tracks statistics, errors, allows maintenance on members data, latest news, shop items, registrations, billing and finance information. Graphic work undertaken on this project involved the creation of logos, banners and background images. This project involved relative freedom, with all but colour scheme.